It’s your last chance, everyone!! It’s up to YOU to come up with the perfect words of shame! Get your creative juices flowing and come up with the funniest caption you can think of and by Friday we’ll announce the winner! You can tweet us, facebook us, or leave your comment below! All that’s left of Santa’s Elf is his tiny red heart. I thought he was the Easter Bunny! Please don’t put me on Santa’s naughty list! I thought it was the Grinch! Naughty list, my foot!! Try telling Santa on me now! Well that’s one reindeer *puts on sunglasses* who won’t guide Santa’s sleigh tonight. This isn’t the stuffing you wanted for dinner? I thought you said you wanted stuffing for the Christmas goose! So…that wasn’t the last treat in my advent calendar? Grandma for run over by a reindeer so I got him back. You’re welcome grandma. I swear the reindeer just exploded. I am innocent. I didn’t mean to kill the reindeer. I hope santa still comes. I am not ashamed. That ornament had it coming!! So what if I get on Santas naughty list, I will chew that up too! I told Santa to come alone. He didn’t listen. Well, what the heck did you *expect* me to do with those calling birds? Sheesh. He pooped in the hall, Mom. I had to kill him! Sorry I’m not sorry. Pieces on Earth, Goodwill to men. I thought we had an understanding about the elf on the shelf…..
I’ve seen Toy Story. That’s so not happening in this house. I am keeping an eye on it just in case it moves again….. It kept playing Rudolph the Red Nosed Reindeer over and over….somebody had to turn it off! I’m so glad you’re here! There was some sort of explosion! Santa did it – and the elves watched. They’re all jerks. Deck the halls with bits of stuffing, fa la la la la la la la la! Don’t look at me, it was the elves! Wait, you’re telling me that they were supposed to intrude the house? Bah! I thought they were humbugs! It just fell apart, honest! He won’t be guiding Santa’s sleigh tonight. What… You get Christmas dinner, but I don’t. *sings* he can’t guide your sleigh tonight. What came out of that? I’m scared to look!!! Now, if I can fake a suicide note on this blank paper, …. I might be able to get away with it! I just had to find out what was inside this funny wrapping paper! Wanted you to see I have the right stuff! Unappreciated artist seeks new environment where creativity is encouraged. Serious inquiries only. You said you were running low on stuffing…..
UPCYCLE (verb). To convert waste material into new products of greater functionality and desirability..
It’s like an Ikea Christmas in here. He won’t be telling Santa if I was naughty or nice now, will he! Well I can’t have any Christmas dinner stuffing so I thought this would taste the same. It didn’t so I am sorry. Ok Ok I did it but they Triple Dog Sared me to! Whatchu talkin about? There’s plenty of presents left under the tree. No, I have no idea who made this mess. None. I was bringing it to you when I slipped on the shiny floors. I’ve fallen and I can’t get up! Bah humbug! I don’t like your decorations. Not sorry. Santa didn’t want cookies…he wanted mayhem! I am so gotta have to put DO Not Destroy anymore TOYS on my New Year’s Resolution list. I thought he was trying to steal the presents! I was just looking out for the family! I was dreaming of a shredded Christmas. Rudolph didn’t even see it coming…..I regret nothing. It was the elf on the shelf. Well, I try to stick to the four main food groups: candy, candy canes, candy corns, and syrups… But even Buddy the Elf ate some cotton balls. Seriously, I don’t know what you are talking about! So long Elf on the Shelf! And that’s what I’ll do to the Target bill too! Waa happened? I just woke up from a nap and….. It was Rudolph…he came with all his friends and did this and left me to take the blame! If there weren’t any witnesses, does it mean this crime never happened?? I heard that gramma was gonna get run over so tried to stop the culprit early! I have eaten the reindeer. Santa can’t leave now right? More presents? I tried to show Mommy what a good guard dog I am…now she’s yelling about coal. The elf on the shelf wouldn’t stop staring at me. See!!! There were no sugar plums dancing in his head! I thought that his nose was the laser light i was chasing. I had to make it stop. I had to know if he had a Christmas heart! I wanted to give you a present too! I told Rudolf he couldn’t play reindeer games with us. Ho ho ho . . . hope you think this is funny. I wanted to be Rudolph! You wouldn’t let me have any of your stuffing so I made my own! STUFFING the turkey? Oops, I thought you said UN-stuffing the turkey… Since I was trying to help, I’m not ashamed! How come I always get the blame ? the taste of her peppermint chapstick. I hope my mom don’t mind it. I got jealous because the family left treats for the reindeer, so I made (and destroyed) a voodoo reindoll. Not ashamed. Not my fault. When your heart grows 3 sizes, you explode. Science fact. What!?!? You said you love jigsaw puzzles. I don’t have any money to buy one for you so I thought I’d give you a home made one. Enjoy! This is payback for those silly dog jackets you force me to wear! It was going to tell Santa I was being bad! I had to stop him! The intruder fell to the floor and I thought he was making a mess. I had to stop him or you will tell me off… Oh, you are telling me off? I decked him…with balls of holy FA-RA-RA-RA-RA-RA RA-RA-RA-RA! How did it happen? Ever hear of spontaneous combustion? I was just getting all the naughty out of me before the New Year begins! If it’s any conciliation, I REALLY liked my Christmas present! Deck the halls with torn up toys! Fa la la la la, la la la la! It was self-destructive. Trust me, I saw it on Mission Impossible! 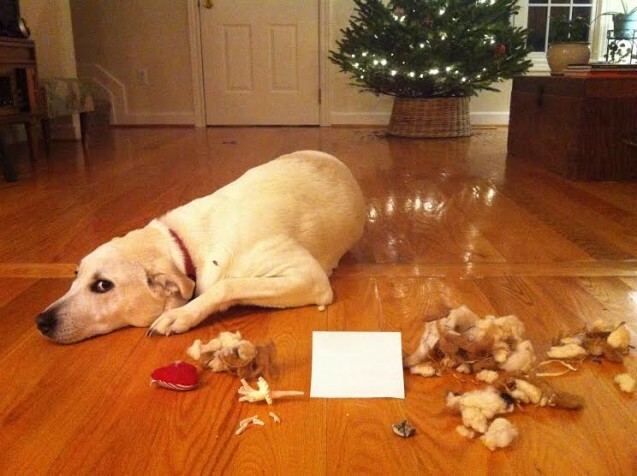 You asked me to destroyed it while you were sleeping. Don’t look at me, as if I am the one responsible for it’s death. The reindeer did it! I tried to stop them but there was to many. I’m Ashamed!! You’re going to take a picture anyhow…Unbelievable!! From the bottom of this heart! You said you wanted a poodle. Now help glue this on me. I killed Rudolph….. Does this mean I’m on Santa’s naughty list now? What? You said you were dreaming of a white Christmas. I had some trouble assembling your gift. he triple dog dared me. I took him up on that challenge. How much longer until the turkey is done? I’m starving! I’ve got the stuffing all ready! But Mom! YOU always say it’s what is on the inside that counts! I WAS dreaming of a white Christmas, WAS…..
My name is Inigo Montoya. You killed my father, prepare to die! Please don’t tell Santa Claws that I was a naughty dog! I don’t know how but it exploded by itself! But we still luvs each other 4ever, right? I have been a good dog this year. Honest. For Christmas I would like a new stuffed toy. The last one… exploded. That’s not what I asked for for Christmas. What? He looked at ME the wrong way! It came that way….I swear! Deck the halls with chunks of garbage, la la la la laaaa, la la la LA. He went 365 says without wrecking/destroying/peeing/barfing/eating something. Supposed to be “days” sorry! They wouldn’t even let me taste the stuffing, so I decided to make my own. What? It’s only that this version of the Nutcracker Suite proved to be a bit too saccharine for my tastes. It’s a present for Santa. I made it myself! ‘Twas the day after Christmas and all through the house, not a creature was stirring not even a mouse! You are welcome. Not sorry-told Auntie Em three times- no more regifting! Regift this. .
Who me?? It was the cat! Yep, definitely the cat. That’ll teach you a lesson not to share Christmas dinner with me!! The cat is trying to frame me!!! You’re welcome. You know you hated that present anyways. I boiled him in his own pudding and will now bury him with a stake of holly through his heart….Bah Humbug! I was looking for fossils. Oh, that was supposed to last beyond Christmas Day!! My bad. What do you mean it wasn’t for me?? Isn’t my name Aunt Gladys?? Sugar plum fairies, my eye! Used to laugh and call him names? Reindeer meat is a big disappointment. Put a fork in it. I’m done! Well last night we were watching that Mcgiver fella and I got confused. Sorry! It was like that when Santa left it. Do not open until Christmas- HA! yeah o k I did it but I am glad I did it. again that fat dude in the red suit left mm butkus., next year there will be a fire in the fireplace. hope he likes toasted buns. Fuzzy wuzzy _was_ a bear. You would not believe me if I told you…..
You really need to take some cooking lessons! I didn’t like the way it was looking at me. It was him or me , I stand by my decision! At least I spared your Christmas dinner. What?… you don’t believe me? I saved Christmas from the Grinch. That WAS the Grinch. It just exploded. What are you looking at me for. You said I could open one early. No backsies! The house is now safe…. I can’t believe the mess Santa left! I left you the heart because i love you. Just call me the Nutcracker! Oops, I thought you said wreck the doll…My Bad. That’s one reindeer that won’t run over any more grandmas. I made it on the naughty list……..again! He loves me, he loves me not – obviously NOT! I specifically told my mommy that I didn’t want to be left at home alone, or else her cashmere scarf would pay dearly. Well, let’s see if she learns her lesson THIS time! !